China’s Xi Jinping: A king of the east of Revelation? Xi took office as president in 2013 and hasn’t said how many additional five-year terms he intends to serve. State media has said the removal of term limits will not alter conditions for retirement or create a president in perpetuity, but has offered no details. said Kerry Brown, professor of Chinese Studies and director of the Lau China Institute at King’s College, London. The ceremonial National People’s Congress voted unanimously on Saturday in favor of Xi serving a second five-year term. Now, having a long-term leader is not, of itself, a negative. ‘Permanent’ leaders can often have the long-view and can work, in theory, better for their nations. Of course, with humans, power and sin can affect them as well, which is one reason many nations have term limits. When this possibility for Xi Jinping was announced a while back, a reader emailed me and speculated that it would therefore seem possible that Xi Jinping could be one of the “kings of the east” from the Book of Revelation. Only China, and possibly India and others in Asia (many of which will align themselves with China and Russia against the European Empire), are capable of fielding a two hundred million man army. This, combined with Revelation 16, is strong biblical evidence that China is at least part of this massive army. They will be involved in what could be called World War Four (World War III is when the USA, UK, Canada, Australia, and New Zealand get taken over, then followed by those of the Middle East and North Africa being taken over by the European Beast power). See that nations are gathered. We also see that nations will gather at Armageddon. China is clearly a nation that biblically is one of the “kings from the east.” Russia, India, Japan, Korea, Taiwan, and others are also probably “kings from the East” (Revelation 16:12) as they all are in the farthest eastern reaches of Asia. China’s Silk Road project looks to pave some of the roads to help get to Armageddon as well as develop some naval ports (watch Is China paving roads to Armageddon?). This project is happening now! “40 At the time of the end the king of the South shall attack him; and the king of the North shall come against him like a whirlwind, with chariots, horsemen, and with many ships; and he shall enter the countries, overwhelm them, and pass through. … 44 But news from the east and the north shall trouble him; therefore he shall go out with great fury to destroy and annihilate many. 45 And he shall plant the tents of his palace between the seas and the glorious holy mountain; yet he shall come to his end, and no one will help him (Daniel 11:40,44-45). Shall be raised up from the ends of the earth. They are cruel and shall not show mercy. Pangs as of a woman in childbirth…” (Jeremiah 50:41-43). Notice that the end time Babylonian King of the North (the European Empire) will overwhelm the King of the South (a Moslem empire), but that those from the east and the north shall trouble the King of the North. This appears to be referring to China and Russia, and apparently India and other Asian nations. And notice that they will be used to help cause the King of the North to come to his end. It may be that Xi Jinping will be involved. The Bible is clear that Europe will one day be hit. But this is at least seven years away (for some biblical reasons, see When Will the Great Tribulation Begin?). However, war is not the ultimate destiny for the Chinese or Europeans. Deification is. 29 They will come from the east and the west, from the north and the south, and sit down in the kingdom of God. 30 And indeed there are last who will be first, and there are first who will be last (Luke 13:29-30). Those from the east and north will include the Asians and Chinese (the south would be those in Africa, Latin America, and many islands). Yes, there will be some from the west, but notice that those in the west are no more prominent than those from the other regions. Many in Asia will be among those who are first in the Kingdom of God. We in the Continuing Church of God understand that God will offer salvation to everyone in this age or the age to come (Matthew 12:32; Mark 10:30). WTO/TTIP and the Babylonian Beast Will international trade agreements like WTO/TTIP/CETA lead to the fulfillment of end time prophecies concerning the Babylonian Beast power that the Book of Revelation warns against? What does the Bible teach? A related video would be WTO Trade Deal and the Rise of the European Beast Power. Another video of related interest may be Trade Wars: Are COG warnings coming to pass? Can the Final Antichrist be Islamic? Is Joel Richardson correct that the final Antichrist will be Islamic and not European? Find out. A related sermon is titled: Is the Final Antichrist Islamic or European? Another video is Mystery Babylon USA, Mecca, or Rome? This entry was posted on Saturday, March 17th, 2018 at 3:30 pm	and is filed under Prophecy. 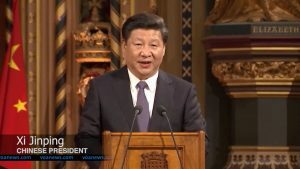 China’s Xi Jinping to stay in office indefinitely? Could he be one of the ‘kings of the east’?